Abell Huse was born about 1602 in Wiltshire, England. His parents were Abell HUSE and [__?__]. He married first Eleanor (Elinor/Elnor) Bird on 5 Jul 1635 in Salisbury St. Edmund Parish. Eleanor died 27 Mar 1663. He married Mary HILTON on 25 May 1663 in Newbury, Mass. Abel died on 29 Mar 1690 in Newbury Mass. Elinor Bird was born in 1602 in London, London, England. Elinor died 27 Mar 1662 in Newbury, Essex, Mass. Mary Hilton was born in 1635 in Newbury Mass. Her parents were William HILTON and Sarah GREENLEAF. Before she married Abel, Mary had two children with Thomas Sears whom she married on 11 Dec 1656 in Newbury Mass. Mary died in 1714 in Newbury, Mass. Thomas Sears was born in 1615 in Cheshire, England. Huse can also be spelled Hewes and Hughes. Abell’s name appears on the proprietor’s book of records, folio forty-four. 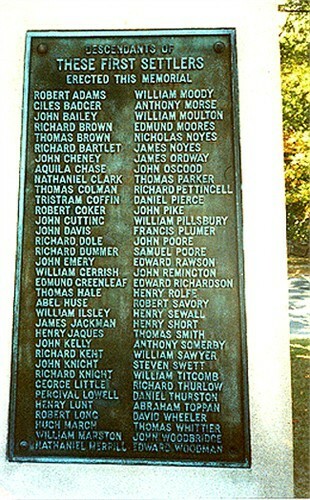 The record is dated December 1642 and is the first known list of the first Settlers of Newbury. Abell was about 70 years old when his last child was born. Many people think that the father of Mary HILTON Downer Sears Huse was William HILTON. But she may have been too young to be the daughter of William Hilton Sr. and too old to be the daughter of William Hilton Jr,. 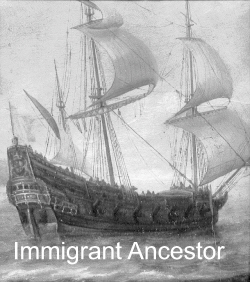 Her parentage remains a mystery.” citation: The Great Migration Begins, Vol 2, pg 955. In this same volume of Great Migrations, on page 947, we are introduced to Edward Hilton, fish monger from Dover, England. His child list by his first marriage to [__?__] contains 6 children with b. dates from 1629 to about 1642. There is a gap from abt 1633 to 1640. Wife [__?__] dies after about 1642. He marries (2) Katherine Shapleigh, widow of James Treworgy. Some say that she was born about 1599 and didn’t give Edward any further children. She already had a large family by Mr. Treworgy. QUESTION: Does anyone have evidence that Edward Hilton and [__?__] gave birth to Mary Hilton in the time gap provided in the child list? Abel’s wife Judith Emery was born 5 Feb 1672 in Newbury, Essex, Mass. Her parents were John Emery and Mary Webster. Judith died 24 Apr 1753 in Newbury, Essex, Mass. William’s wife Ann Russell was born about 1673 in Essex, Mass. 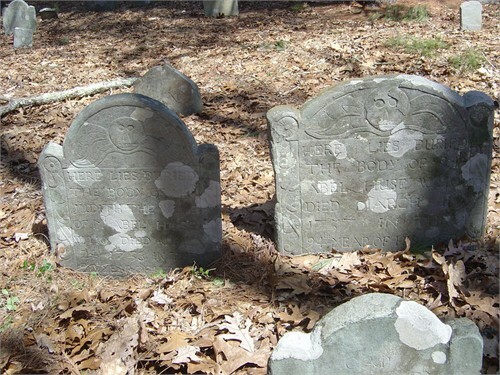 Ann died 02 June 1733 in Mass. This entry was posted in 12th Generation, Historical Monument, Immigrant - England, Line - Miller, Line - Shaw, Missing Parents and tagged Newbury. Bookmark the permalink. Can you tell me where you were able to obtain the name of Abel’s father (apparently, also ‘Abel’)…? Thanks for your comments, I’ve added Bird and Ebenezer. My grandmother’s name was Eleanor. It’s interesting that they spelled it Elnor in the old days. I got Abel Huse’s father’s name from Steve Condarcure’s Genealogy Data Base. This database has been very helpful in filling in lots of ancestors quickly and I’ve found it to be correct more than 90% of the time, but it doesn’t include any footnotes or links to original documents. This source had Abel being born about 1603 which would make him over 70 years old when his last child was born. Condarcure’s DB has 1615 which is still old to be having more kids. Thanks for the information…I much appreciate it. My best guess on the “Downer” alias is that it is a corruption of the term “dowager” or “dower”…i.e., widow (http://en.wikipedia.org/wiki/Dowager). Just my intuition. She was unmarried for just two years after Thomas Sears’ death before marrying Abell, so I don’t think she had another marriage to account for. P.S. Here’s a direct and no-cost link for the Abell and Elnor Huse marriage record in “Phillimore’s” parish marriage registers, a series of books published in the late 19th and early 20th centuries that catalogues British marriages. The editor of the books (“WPW”) is William Phillimore Watts. We now have a photograph of the original marriage record (July 5, 1635) of Abell Huse and Elnor Bird. Let me know if you’d like a copy. Coat of Arms removed. In reality, Abell Huse was not part of the gentry and did not have a coat of arms when he came to America. Umm if it is my family’s coat of arms isn’t it our property? When I seen your last name sir it didn’t say HUSE anywhere in it. How can you copyright our stuff unless it’s a fake? Which would be false advertising and grounds for a class action lawsuit.